HR Owen’s Rolls-Royce Motor Cars London dealership will occupy a series of locations around the capital as part of a ‘Progress Tour’ to promote the brands ahead of the opening of a new dealership. Work will commence on the AM100 retail group’s new London showroom in the coming weeks and, as the existing Berkley Square operation will continue to operate from Berkeley House, hotels and luxury shopping destinations will also get a taste of the Goodwood-based manufacturer’s products. The two-week touring presence will commence on April 16 in Kensington and Chelsea, before advancing to noteworthy locations in Hammersmith and Fulham, Southwark, Wandsworth and Camden before finally arriving at its spectacular new home in Mayfair, Westminster, later this year. HR Owen’s Berkeley Square showroom is set to make its move following a 12-month consultation with property advisors of Rolls-Royce Motor Cars to seek an alternative location. A statement issued by Rolls-Royce said that “the existing flagship showroom on Berkeley Square in London is no longer able to reflect the breadth of Rolls-Royce’s offering”. It said that, following an extensive search, a “truly befitting new home for the marque’s flagship location” had been secured. Torsten Müller-Ötvös, the chief executive of Rolls-Royce Motor Cars, said: “The Rolls-Royce showroom in London is our flagship store worldwide and I am delighted by the prospect of HR Owen moving to more representative and appropriate premises in Mayfair. 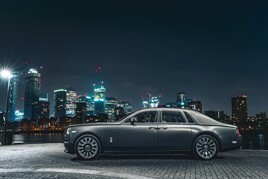 Claus Andersen, dealer principal at HR Owen’s Rolls-Royce Motor Cars London dealership, said: “We look forward to taking Rolls-Royce Motor Cars London to a number of the city’s boroughs en route to its new home in Mayfair.